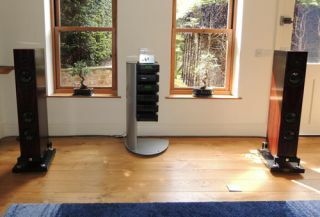 Vote for your favourite setup from this month's #WHFsystems | What Hi-Fi? From tantalising turntables to tempting televisions, we've been inviting you to share snaps of your hi-fi and home cinema setups throughout May by using the #WHFsystems hashtag on Twitter and Facebook – and there have been some stunners. Now it's your chance to win! We've selected 10 of our favourite #WHFsystems from all the entries received over the past month and are asking you to vote for which is the best. The owner of the winning setup will then win a prize – a fantastic pair of NAD HP-20 in-ear headphones. But that's not all – because just by casting your vote, you'll also be putting yourself in the hat for a prize, too – an Acoustiphase Mini Cannon Bluetooth Speaker. Take a look at our #WHFsystems shortlist below and share your opinion with us for a chance to win! Of course, you can also search using the #WHFsystems hashtag on Twitter and Facebook – and don't forget to continue sending in pics of your setup this weekend too! If you can't see the iframe above, click here to cast your vote.